My mum never made rice pudding. She said that, as a kid, she ate so many of it during Second World War that she can't even look at it. So... 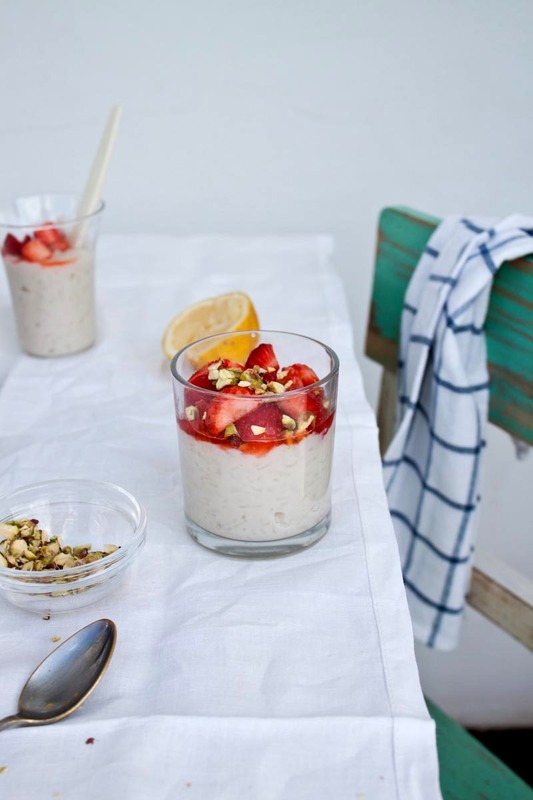 I never ate rice pudding as a kid, and even more, as I heard my mum saying this story few times, I thought it is something not so tasty and didn't even want to try it when I had chance. And then I moved to Portugal, country where arroz doce (sweet rice) is the most common dessert. Hmmmm... for someone who didn't had a rice pudding in front really often for 30 years of life, this was kind of a shock. I was asking myself, how can THAT be the most common dessert.. something worshiped??? Until the day I gave it a chance and tried it. 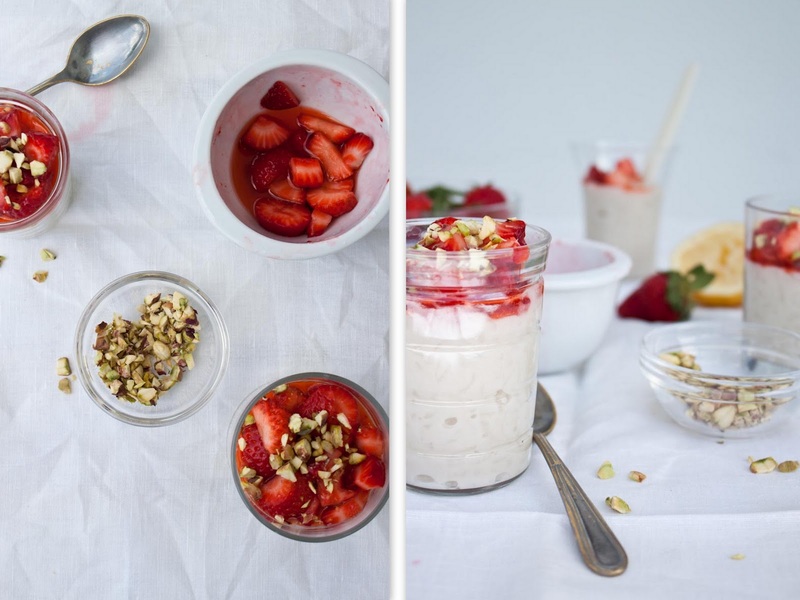 Rice pudding with strawberries and pistachio is a summer version and it's made with coconut milk (you can use cow milk with/without cream), since I can't eat cow milk. A minha mãe nunca fez pudim de arroz. Ela disse que, quando era pequena, comeu tanto durante a Segunda Guerra Mundial que não pode sequer olhar para ele. Portanto... eu nunca comi pudim de arroz quando era pequena, e ainda mais, como ouvi a minha mãe a contar esta história algumas vezes, fiquei com a ideia que é algo não tão saboroso e nem sequer quis experimentar quando tive hipótese. E então mudei-me para Portugal, país onde o arroz doce é a sobremesa mais comum. Hmmmm... para alguém que não tinha um pudim de arroz à frente muitas vezes durante 30 anos de vida, isto foi uma espécie de choque. Interrogava-me sobre como é que ISSO poderia ser a sobremesa mais comum.. algo adorado??? Até ao dia em que dei uma hipótese e experimentei-o. Pudim de arroz com morangos e pistachio é uma versão de verão e é feito com leite de coco (pode usar leite de vaca com/sem creme), já que não posso comer leite de vaca. Place the rice, coconut milk and sugar in a medium pan over high heat and bring to the boil. Reduce heat to low and cook, stirring occasionally, for 25-30 minutes or until rice is tender. In the meantime cut the strawberries, and mix with lemon juice and sugar. Leave in the fridge. 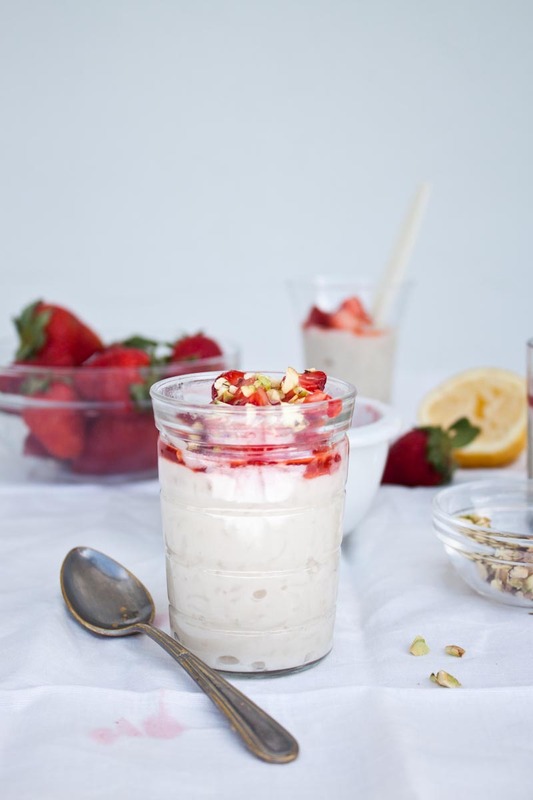 Serve the pudding with strawberries and sprinkle with chopped pistachio. Coloque o arroz, leite de coco e o açúcar numa panela média em fogo alto e deixe ferver. Reduza o fogo e cozinhe, mexendo ocasionalmente, durante 25-30 minutos ou até o arroz ficar macio. Entretanto corte os morangos e misture com o sumo de limão e açúcar. Deixe no frigorífico. Sirva o pudim com os morangos e polvilhe com o pistachio picado. This looks so yummy and tasty and I would love to try it with coconut milk. For me, rice pudding is quite common as my mum prepares it frequently when I get home. I am used to the traditional version topped with cinammon, but some of my family members from the Prizren region use to eat it sprinkled with fresh lemon juice. Odlična kombinacija, i ja je radim sa voćem. Fotografije su divne, odišu svežinom i nežnošću. Original combinación de sabores. Habrá que probarlo. beautiful Sanda the images are stunning, such richness to them. my grandmother made rice pudding when i was young but i did not like it and have hardly had any i need to change that.